Also could you help me how can I copy the pictures io posting the webpage? "link and insert picture is not working for me "
Basically GM injected items. There existed an MD+8 with dex bonus back in Beramus and everybody knows the infamous Mirage+8 with poison. Normally they're trying to make it less obvious though. Edit: The problem is though, that the existance of those items can't be verified without more proof, like database access or verified screenshots. It's pretty easy to fake items, although I don't know why people would do it now. A lot of people did it in the past just to make bad youtube videos and start rumors. I was surprised when saw this guy was selling 3 piece of chitins with 85dd for 3k tl. I tought GM's already deleted those items, but the guy just showed me. 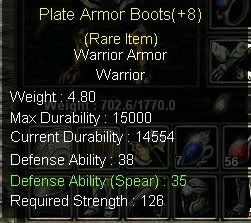 On Gordion theres a lots of +10 item, but these items are very RARE. Any idea why couldn't I post the picture but the site adress? [IMG] [/IMG] is required to make it show a picture.